Travel. Blogging. Do these two words belong together? In the view of thousands of people who are busily blogging about their travels, they do! (Disclosure, one of these people is my wife). The Travel Industry. Think about the Hotels, the Tourist Boards of hot destination spots, the cruise companies, and so on. They use to host all sorts of junkets for the travel agents trying to get them to steer traffic their way. But, as travel agents go the way of the dodo bird, the tourist promotion people are not sure what to do. They alos use t host lots of travel writers for different magazines but as the number of magazines and newspapers continues to shrink, they are again left looking for their new media for travel promotion. The Audience. Travel is a huge industry and people want to be informed buyers. They want to be educated about where they are going and what to do there. Of course, the first stop is usually Wikipedia or a travel guide but they tend to be strictly the facts or overly professional in their descriptions. The travel bloggers tend to give readers a much more impressionist feel for the experience of visiting. Also, traffic bloggers write about some of the most interesting and surprising things. For instance, France in Miniature. 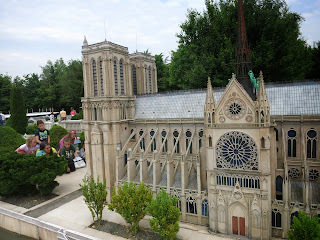 Notice the kids on the left side that give you a sense of the scale of this version of Notre Dame! The Travel Bloggers. What's not to like? They like to travel anyway and as travel bloggers, they get additional attention and often access to preferred tours and information. It also provides an agnle to the travel which makes it more ao f thoughtful visit. Of ocurse, it's alos an awful lot of work. Great photography is key to a good travel blog and the best pictures seem to require getting up at before dawn to be in position or at sunset which requires excellent timing. I was just reading a luxury travel blog about staying in a casa particulare in Trinidad Cuba. It's definitely the best way to get to person-to-person travel, essentially it's a bed and breakfast. Highly recommended. While there are lots and lots of great travel blogs, CarmensLuxuryTravel.com takes the cake as having the best and most photography. Is's so cool to see all about her travels.